John Hope Bryant wants people of all color and races to become fully integrated into our nation’s economy. He has been a financial advisor to three U.S. Presidents, and motivated the government to rename the U.S. Treasury Annex Building in January 2016 to the Freedman’s Bank Building. The chairman and CEO of Operation HOPE, Bryant immediately started the 501(c)(3) tax-exempt organization in 1992 for social investment banking in neighborhoods after the Rodney King Riots in South Central Los Angeles. In December 2016, Bryant was named “Innovator of the Year” by American Banker for expanding this model into bank branches throughout the U.S.
As a nonprofit, Operation HOPE has directed more than $1.8 billion in private funding to our low-wealth communities since its inception 25 years ago. Today, HOPE can be found in more than 300 U.S. cities, as well as South Africa and other nations, through a legion of 22,000-plus volunteers in its HOPE Corps. Bryant delivered the closing keynote address on “How the Poor Can Save Capitalism: Rebuilding the Path to the Middle Class” on May 11 at the Center for Nonprofit Management’s (CNM) Bridge to Excellence Conference at Belmont University. That is also the title of his latest book. The Tennessee Tribune sat down with Bryant for Part I of this interview about how nonprofits such as Operation Hope are bringing economic empowerment to the marginalized in the U.S.
Q: Your keynote speech on May 11 was highly anticipated at the Center for Nonprofit Management’s sold-out Bridge to Excellence Conference at Belmont University. How can we as Nashvillians change the world through nonprofits that will lead to the poor saving capitalism and rebuilding the middle class? A: Nonprofits are a large sector not getting the credit they deserve in our economy. All the work on the Underground Railroad, churches, the Civil Rights Movement, and the anti-Apartheid Movement was all done with nonprofit organizations. There’s a gap in society and nonprofits are standing in that to meet today’s challenges. The legacy and necessity for this sector today is to re-imagine how they operate. What happens with their government support, when it quits flowing overnight? Nonprofits may have to merge with other nonprofits. I want to encourage them—they are our army—because it’s all coming back to their marching forward into that critical role. Q: Since we just celebrated Mother’s Day recently, how did your Mom change your life at age 10 by making a $40 investment in your first business idea? And, what did you learn from—or do with—that, which still makes her (and you) proud today? A: It was transformational. She didn’t just give me money, but she made me pay it back. And, she told me she loved me and that gave me self-esteem. That first business idea was for a candy house. The kids in my neighborhood were going to the liquor store to buy their candy, and I kept telling the owner that he needed to change his inventory. Eventually, he tried to hire me to stand and sell all the kinds he was offering at the counter. That wasn’t what I really wanted to do. I wanted to be a box boy in the back, and he told me it paid less than being in the front. So, I worked for him around the dock—where the inventory was being unloaded—and I took down all the names and addresses of the candy suppliers. Then, I quit after three weeks and started my own candy house, where I was earning $300 a week. And, the liquor store stopped selling candy in my neighborhood. I think you’d have to call my mother to ask her what makes her proud of me today after that experience. Q: Your nonprofit Operation HOPE has a vision and a mission of making free enterprise work for everyone—regardless of age. So, how will your Banking on Our Future and HOPE Business in a Box assist at-risk youth (and especially African Americans) now and in the future throughout America? We will continue to open 1,000 HOPE Business in a Box Academies by 2020, and that will lead to 4,000 to 5,000 schools for teaching kids about financial literacy through our Banking on Our Future Program in the U.S. and South Africa. We will measure their impact and outcome. And, we will connect education and aspiration. I tell youth that if you can’t get a job, create a job. Q: Your foundation began HOPE Inside in 2014 by getting space for nonprofit financial counseling in locations in First Tennessee Banks. How are you expanding in Nashville, especially with youth banking services and adults in low income neighborhoods? A: We will become the Starbucks of financial inclusion—the private banker for the working class, the struggling class, the teetering class. 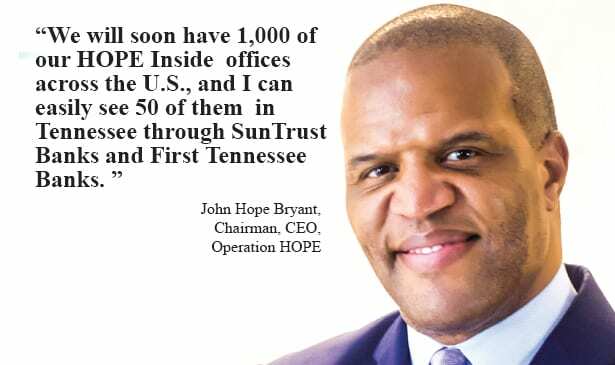 We will soon have 1,000 of our HOPE Inside offices across the U.S., and I can easily see 50 of them in Tennessee through SunTrust Banks and First Tennessee Banks. And, we will increase our credit scores 120 points on the average over 24 months. We will finish the unfinished work for African Americans of the Freedman’s Savings Bank (which was dissolved in the post-Civil War period 1865-1874) to increase our prosperity through our free enterprise system. Previous articleIs the Glass Half-Full or Half-Empty for HBCUs?